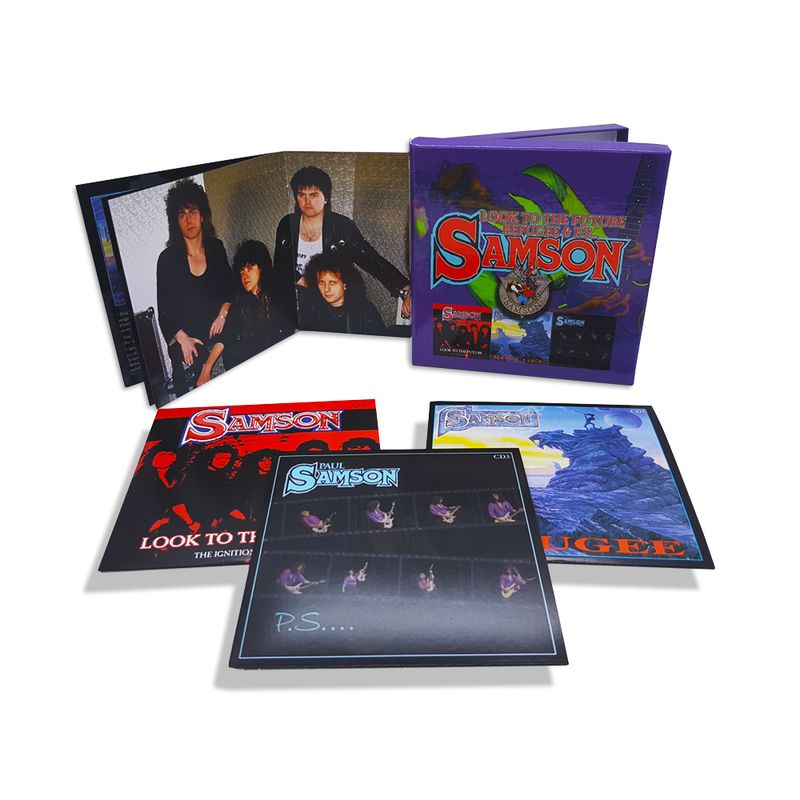 A 3CD Box Set of Samson material. This collection features 1989’s previously unreleased “LOOK TO THE FUTURE”, 1990’s “REFUGEE” and the 2006 final album “P.S….”, recorded during Paul Samson’s final months and released posthumously in 2006. Samson’s career goes back to the mid-1970s London pub and club circuit, with a membership that has included John McCoy (Gillan, Mammoth), Nicky Moore (Mammoth) Clive Burr (Iron Maiden) Bruce Dickinson (Iron Maiden), Dave ‘Bucket’ Colwell (Bad Company), Mel Gaynor (Nolans, Simple Minds) Pete Jupp and Merv Goldsworthy (FM) and legendary drummerThunderstick. The “Heavy Metal Crusade” tour of 1979, where Samson were supported by up and coming East Londoners Iron Maiden, alongside Saxon, Angelwitch and the Nicky Moore Band, is renowned for being the beginning of what became known as the “New Wave Of British Heavy Metal” (or NWOBHM). By July, the band had expanded to a four-piece with the addition of vocalist Bruce Dickinson. Over the following two years they released “Head On” and “Shock Tactics”, and toured with Rainbow, Uriah Heep and Robin Trower, among others. Paul Samson recorded the solo album “Joint Forces” with both McCoy and Moore, after which he formed “Paul Samson’s Empire” to promote the album, which included shows with Iron Maiden on their “Somewhere On Tour”. Paul spent the next few years pursuing various Samson projects, as well as following his passion for the blues which led to a period in Chicago with the Richard Black Project, before the late 90s brought about a much demanded Samson reformation, which lasted until his sad and untimely death in 2002. This collection kicks off with 1989’s previously unreleased album “LOOK TO THE FUTURE”. Empire had given way to a new version of Samson and singer Peter Scallan had taken over from Mick White, whose departure led to the abandonment of the partly recorded “Ignition” project. Songs were re-written, arranged and recorded with the continuing line up of Toby Sadler (Keyboards), Dave Boyce (Bass) and Charlie Mack (Drums) along with Paul Samson and Peter Scallan, but on their completion and presentation to record labels were considered not guitar- based enough for a Samson album, and the release was shelved, despite already being announced in the music press. The recordings have been locked away in the Paul Samson archive, but when the reissue of “Refugee” was first mentioned, Dave Boyce, Peter Scallan and Hugh Gilmour from HNE suggested that this collection would be the ideal place to release them. The 11 tracks on the original track listing include re-recordings of Too Late’ and ‘The Silver Screen’ from the “And There It Is” mini album as well as a new take on the Samson standard ‘Losing My Grip’. Upon restoring the recordings, another track was found, ‘Who Do You Think You’re Foolin’’ which has been included as well as two bonus tracks from the original “Ignition” sessions featuring singer Mick White. Following the shelving of these mixes, Paul Samson went back into the studio and remixed the tracks, mixing down the keyboards and backing vocals, replacing the bass and adding more guitars. The track listing was revised, two songs were removed and replaced with instrumentals and the album was released in 1990 as “REFUGEE”, which is featured on disc two. The instrumental ‘Room 109’ became a regular stage favourite from then on. The four bonus tracks on this disc are from the BBC “Tommy Vance Friday Rock Show” session recorded in July 1989, courtesy of the BBC. Following the release of the album, Paul broke his hand and by the time that it was healed the momentum had gone and new projects were in the pipeline so unfortunately this line-up never toured to promote the album. Paul Samson spent much of the 1990’s on the road and in the studio with various projects, including playing the blues circuit with Ric Lee’s Breakers (featuring the ex-Ten Years After drummer and ex Savoy Brown bassist Ian Ellis), also American tours and recordings with The Richard Black Project from Chicago. A reformation of the original Samson line-up was always on the horizon and on August 1st 1999, the reformed Samson line-up of Paul Samson, Chris Aylmer (Bass) and Thunderstick (Drums) played the NWOBHM 20th anniversary show at Hibiya Park, Tokyo. Their return to the UK heralded the return of Nicky Moore on vocals and more live shows. New material was written and preparations were made for recording a new album using Billy Fleming (drums), Ian Ellis and John McCoy (Bass) alongside Paul Samson and Nicky Moore. Paul moved away from London and whilst setting up his own studio and starting to record the new album was diagnosed with terminal cancer. Paul Samson passed away on 9th August 2002 and the task of completing the album was given to his close friend and bandmate John McCoy. The origins of the songs ranged from rehearsals with Thunderstick and Chris Aylmer in 1990, writing sessions with Ian Ellis in the mid 90’s, the Samson reformation rehearsals with Nicky Moore, Chris Aylmer and Thunderstick in 1999-2000 and the most poignant “Shooting For The Moon” with Nicky Moore whilst recording the album. 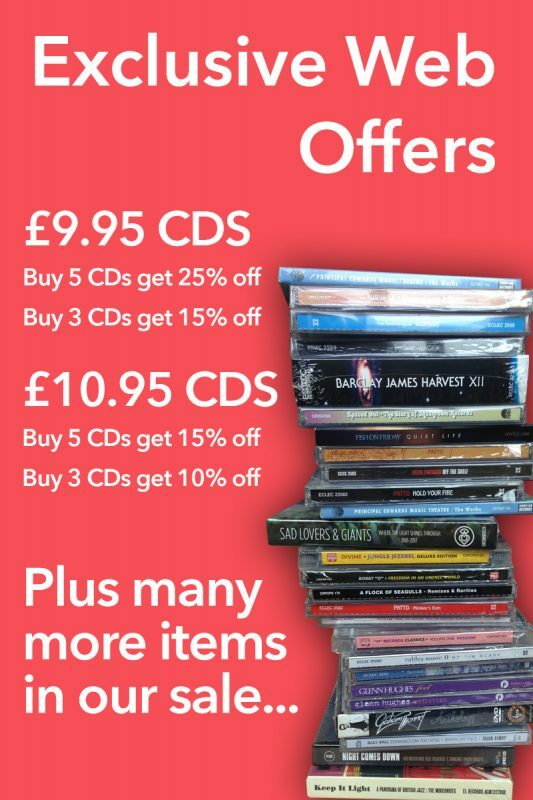 The original plan had been for the new Samson album to be titled “Brand New Day”, but due to Paul’s death and the fact that the line-up on the recordings had not toured as Samson , it was decided as a tribute to Paul it should be released as a Paul Samson album, and John McCoy’s suggestion of “P.S….” as the title was most fitting.